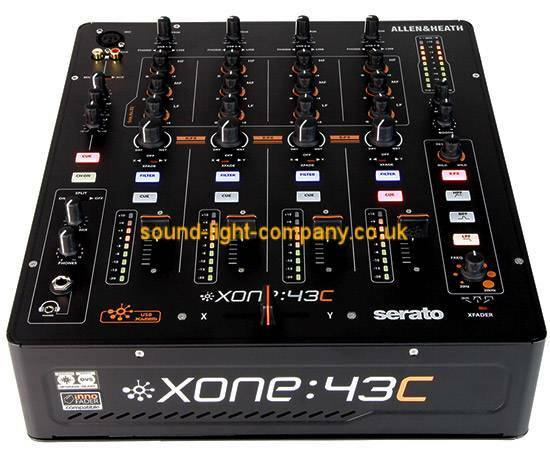 Xone:43C is the perfect gateway to the full spectrum of digital DJing. The mixer is supported by leading DJ Software, Serato DJ, and is DVS upgrade ready with the addition of the Serato DJ Club Kit • eliminating the need for any external interface. Whatever your workflow, Xone:43C delivers a uniquely fluid mixing experience. With balanced XLR main outputs, independent booth and record outputs, Xone:43Cÿ has the quality and versatility to become the centrepiece of the club booth or audiophile personal DJ setup. Xone:43C is an affordable, elegant solution for using Serato NoiseMap(TM) Control Vinyl or CDs for hands-on control over Serato DJ software. For new users, simply purchase the Serato DJ Club Kit which is available in-app within Serato DJ or via the Serato Online Store. Xone:43C offers a convenient, plug 'n play route into DVS DJing, eliminiating the expense and clutter of using an external interface. (Mixer does not support full control of Serato Video). An intuitive and simple new way to work with external FX • X:FX provides a single control per channel over the send/return to work with external FX units. For even more hands-on creativity, the X:FX can also be routed to the Xone filter to add layers of FX and filtering.. For even more hands-on creativity, the X:FX can also be routed to the Xone filter to add layers of FX and filtering.